The word commercial implies that commercial floors are just for business and providing a ground to walk on. This might have been true in the past, but today designers and manufacturers are giving more attention to commercial floors and how they can help businesses and floors in ways beyond just providing a place for people to walk. One big use of commercial flooring is in restaurants and other eating establishments. And this is for several reasons. One is the fact that commercial flooring and commercial flooring mats are easy to clean and durable under a lot of stress. These are great qualities to have, especially in the back rooms and kitchens where messes abound and employees are standing for long periods of time. Commercial flooring in this environment also has some options: tiles, concrete, and rubber. Tiles work well due to their ease of installation, as well as being cost efficient to replace. If one commercial flooring tile is damaged, it can be removed and replaced. Concrete, when used as commercial flooring, stands up to years of abuse from table and chair legs, as well as constant movement of employees. Rubber commercial flooring and commercial flooring mats are meant to ease the aches and pains sometimes associated standing and walking on harder concrete floors for long periods of time. These commercial flooring options, too, are simple to clean and maintain, but provide more cushioning for hard working employees. For esthetic purposes, restaurants can use commercial flooring to add to their decor. Commercial carpeting can help muffle noises. Wood commercial flooring looks great and is easy to clean. No matter the design concept, commercial flooring can help — it’s not just for the back room anymore. Wood floorings are derived from the hardwood trees, since the growth or removal of such trees are very easy. In office buildings, commercial floors help to keep the atmosphere quiet with commercial carpeting as well. Of course, medical offices benefit from commercial tile or even wood. The surfaces are easier to keep germ and disease free for sick patients. 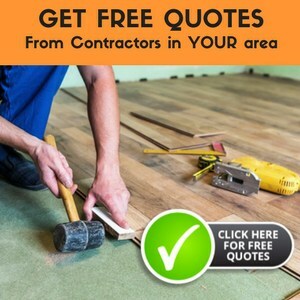 Let’s talk about each kind of commercial flooring. Wood commercial flooring is available in a variety of grains and woods: maple, oak, ash, walnut, along with exotic woods. They can be manufactured in patterns and designs that are geared to the overall look of the space. Concrete commercial flooring is certainly the easiest method for flooring as it can be painted or stained quite simply, but it can also be covered by a variety of other flooring types. Many businesses choose to put down slip-resistant flooring that is especially made for areas that are prone to moisture or spills. There are also options that lessen the static charge build up in the floor — especially good in areas of high voltage work, intricate machinery, and even computers. Rubber and vinyl commercial flooring can also be made for safety with their ability to have non-slip textures. You can also find commercial vinyl flooring that is designed to have the look of wood or marble. The options are endless in terms of safety features and contemporary design. Commercial floors aren’t just something to cover the foundation anymore. They’re now the way to project your business’s personality to your customers in a creative and safe manner. Look into the various options that commercial flooring can offer. The best answers are right under your feet. The carpet tiles deliver a high level of durability and complete flooring solution for several types of spaces: bedrooms, family rooms, basements and also even in commercial office environments. Carpet tile deck is definitely not hard to present, and in addition easy to supplant if a tile gets hurt. This suggests you won’t be stuck looking at pet clamorous stores and spills until the end of time. Carpet tiles are a basic, low upkeep mat deck decision.Accessible in numerous styles and hues, these floor tiles are sure to make any room pop.For these tiles, no expert is required for establishment, and if one somehow managed to end up harmed, you can without much of a stretch evacuate and supplant it.Contrasted with zone mats, the way that you can make one of a kind region mats that nobody else would have is an enormous in addition to. I have a small commercial project of about 1500 sf. The on grade concrete floor is 9 months old. There is a joint where the concrete was stopped at the end of the day and started again the next. It is a troweled edge expansion joint and is not perfectly level on both sides of the joint. There are also some cracks, both controlled joint cracks and some hairline stress cracks. We will be installing ceramic over the concrete. What can you offer me as to advice on crack treatment and fracture control? What products seem to work well and are economical. What is the most efficient way to address the uneven joint? Thanks in advance. Ryan E.
What do you mean by an ‘uneven expansion joint”? Is one edge up higher than the other or is higher or lower than the rest of the floor where these two areas meet? Have you spoken to the contractor about the stress cracks that have appeared in this fairly new concrete floor? As far as what you can do about these issues, this has been covered elsewhere on the site, most likely under concrete flooring or one of the basement catagories. hi! I dont know if you can help me but here goes. I clean a restaurant with concrete flooring.There is alot of stains grounded in the flooring, I would like to know what product with remove those stains or what product with give it a shine as the said that they tried a sealant but the concrete floors are heated and it got slippery for the waitresses because of the heated floors. A vinegar and water solution would be good to clean with, and removes grease. If that does not work, you may try StainSolver on the floor. Sealing the concrete would be the way to keep it from becomming stained and to make it shine. Since that will not work because it is too slippery, you may try looking for a textured sealer that will provide protection and grip. I have an concrete basement floor that was painted about 20 years ago. It is stained and hard to clean properly.We have a dog that also has his favorite spot on this floor to urinate. Can you recommend a product that I could use to clean and seal this floor so it will make clean up of this kind more thorough which would prevent future damage to the floor?